During a recent international flight my 4 year old daughter informed me that I shouldn't put toilet paper in the toilet but should instead use the bin provided. My gut told me she was wrong, however I accepted this could just be bias due to my Western upbringing since I am well aware that there are plenty of places in the world where you indeed don't put toilet paper in the toilet. There were no further signs that explicitly stated if the tissue depicted in the signs was toilet tissue or not, or what should be done with it. Further more I couldn't find anything in the literature provided at my seat and I decided not to ask the flight attendant but to instead wait until I was home to ask strangers on the internet. 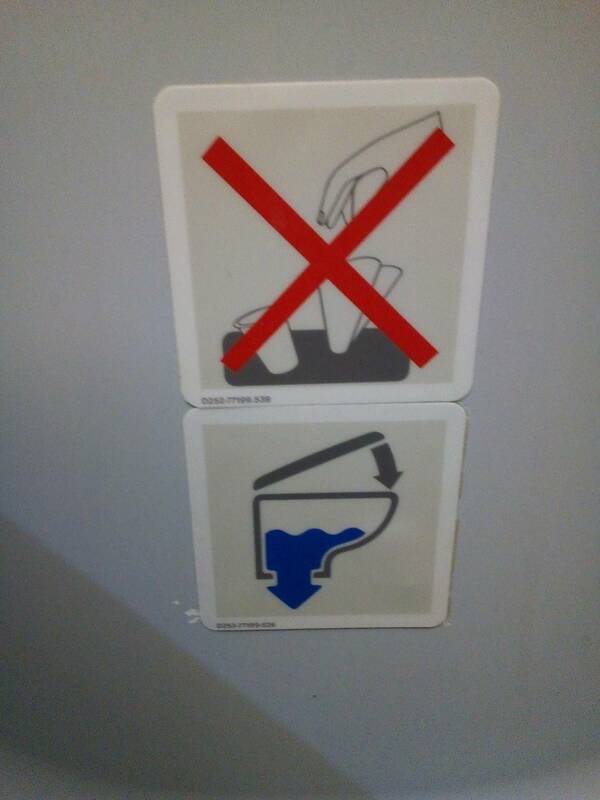 What is the proper way to dispose of toilet roll on an airplane? Understand that toilet paper is designed to be just solid enough to get the job done, but not so solid that it cannot be broken down as waste later once it is wet (this is a general rule for paper waste not specific to airplanes). Too many people think that paper is paper and just flush whatever down, not realizing that it can clog the system (paper towels, for instance don't readily break down when wet by design). As proof that you can flush toilet paper, here's a video of test engineers for the A380 system flushing toilet paper to test the waste system (at 130MPH!). Note how the toilet paper is totally pulverized by the time it reaches the tank. Should I put toilet roll in airplane toilets? YES. 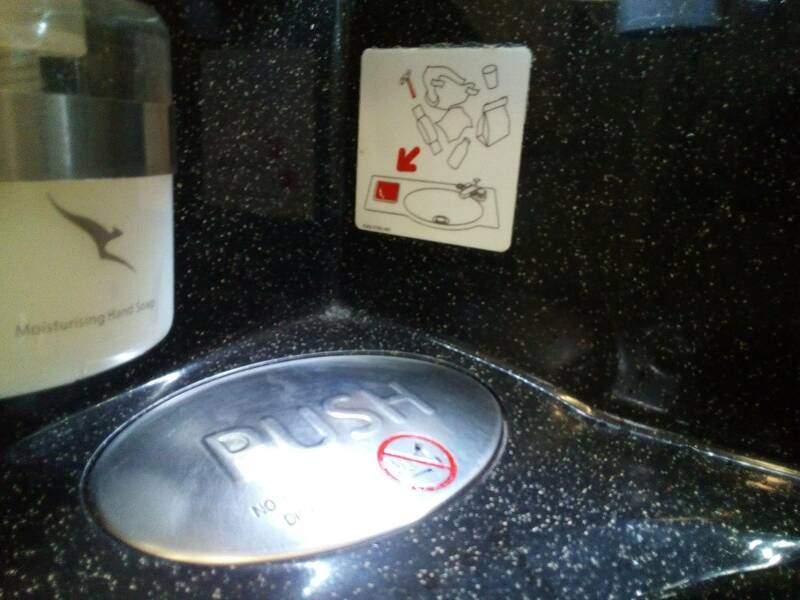 Airplane toilets are designed to take the toilet paper provided by the airline. The sign is to inform you that nothing other than the provided toilet paper should be put in the toilet, including the paper towels used to dry your hands. Key point from the comments: toilet paper is engineered for it's specific setting. The tp provided by the airline is designed to be flushed in airplane lavatories. A typical lavatory will often contain two paper products. Toilet paper is intended for cleaning your nether regions. It is soft (usually!) and is not intended to retain any strength when wet. It is actually designed to turn to flushable mush on contact with water, and to essentially disintegrate the longer it stays in water. As such, the toilet paper on the plane is safe to put down the toilet. Paper hand towels on the other hand are usually less soft. They have a high fibre content, and are designed so that they do not lose significant strength when wet. As a result, paper towels will easily block up a toilet, and must not be flushed. This is what the sign is referring to which your daughter spotted. Toilet users will often also use other disposable cleaning products. Tissues, wet-wipes, sanitary towels and so on are all designed to retain strength when wet, and again will easily block up toilets. It's worth noting here that even so-called "flushable" wipes have been found on testing to retain significant strength and to be a very real problem for waste disposal systems. The sign also relates to these. Chemical toilets in caravans and boats have smaller-diameter pipes, generally with a macerator to break up "solids", and regular toilet paper can block this very easily. Some people use regular toilet paper and provide a bin. Alternatively it is possible to buy special toilet paper which breaks down much more readily when wet. Coming back to your airplane toilet, if the airplane toilet needs this special toilet paper, you can assume that this is what the airline provides. If for some reason you have your own toilet paper though, you might want to be cautious and dispose of that in the bin. Regarding your point about toilets in other countries which cannot take regular toilet paper, the mush of wet toilet paper can still clog up narrow pipes, especially with longer pipe runs which may not have enough gradient to keep things moving. In some countries with smaller-diameter or lower-quality sewer pipes, toilets therefore have a bin for toilet paper. (In Europe, Greece is the main place you would see this.) Whether modern sewage systems genuinely still have problems with toilet paper is unclear - it is entirely possible that the previous technical issues have set up a tradition. Not the answer you're looking for? Browse other questions tagged air-travel local-customs hygiene toilets or ask your own question.